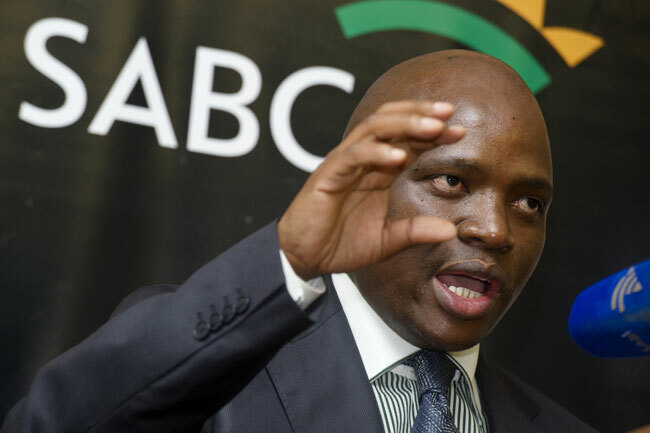 SABC COO Hlaudi Motsoeneng earned R2.87 million in 2013, Communications Minister Faith Muthambi said on Wednesday. In written reply to a parliamentary question by the Democratic Alliance, she said that in 2012 Motsoeneng had earned R2.48m, and in 2011 R1.61m. SABC acting chief executive Tian Olivier earned R871,000 in 2012 and in 2013 he earned R1.758m for being acting chief financial officer for 11 months and CEO for one month. Acting CFO James Aguma earned R122,000 for the month he was employed in 2013. In July this year, the SABC paid R65.76m in bonuses to staff members after protracted wage negotiations for the 2014/15 financial year. “Part of the wage negotiated settlement included a once-off, ex-gratia payment to employees,” Muthambi said in her reply. She said individual performance assessments were not done and the payment was not based on individual performances but on the overall performance of the SABC. DA MP Gavin Davis said in a statement the DA believed Motsoeneng should have been fired a long time ago. He said a reply to a DA parliamentary question has revealed that SABC Motsoeneng’s R2.8 million salary for 2013 was more than President Jacob Zuma earned. He said Motsoeneng’s pay in 2010 was R334,167. Davis said Motsoeneng had been “protected, promoted and rewarded” for his political loyalties to Zuma. Speaking on the bonuses staff received in July, he said the DA supported a system of bonuses and salary increases based on individual performance. “Indeed, there are many dedicated SABC journalists and operational staff who do excellent work under very difficult circumstances. They should be commended and rewarded,” he said. It was unclear how the SABC could justify paying “exorbitant salaries and bonuses” because there were still huge problems facing the public broadcaster. In August, the DA applied in the Western Cape High Court to have Motsoeneng’s appointment set aside. It wanted an urgent interim interdict suspending Motsoeneng pending a review of the decision to appoint him and argued that Motsoeneng should be suspended as soon as possible because he was a “toxic influence” who would stop at nothing to get what he wanted. In February, Public Protector Thuli Madonsela released a report on Motsoeneng, while he was acting COO. She found his salary increased from R1.5 million to R2.4m in one year, that he had purged senior staff, and misrepresented his matric qualifications to the SABC. Madonsela recommended that a new COO be appointed at the SABC within 90 days. In July, Muthambi announced Motsoeneng’s permanent appointment. She said he was cleared of all wrongdoing by a legal firm before the decision was made.